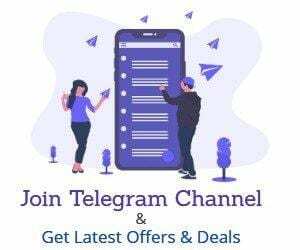 (Loot Internet Offer) Airtel– Provides Free Internet By Giving Just A Missed Call On 5999555 Number Through Your From Number. There Have Some Conditions. Read About Full Details To Garb Free Internet On Your Airtel Sim (Offer Applicable On All Airtel 4G Sim Card). How To Get Free 2GB / 3GB / 4GB Internet Data. Just Give A Missed Call On A Toll-Free Number. The Offer is Tested in Some State Check Yours Wait 1 Hour to Get Data SMS. This amazing offer is very old & it was started 2 years ago when airtel first launched 4G Internet on market. the first-time airtel provides free 30 GB 4G data for dialing 5999555 as demo offer. but now airtel effected by jio starting to provides free internet to take the customer on their service. 3. Message Will Be Like This – Congrats! 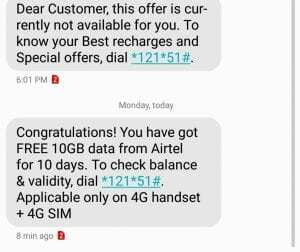 You have been credited with Free 10GB 4G/3G Data, valid for 10 Days. Ensure you switch network settings to 4G/LTE to experience high-speed internet on India’s Fastest 4G network. To check balance, dial *121*2#. Free data can be used only on the 4G handset. 6. You, Will, Get Balance Details By Popup Notification. My call is disconnecting automatically.